Summer’s in full swing here, and while we spent all of last week celebrating some of the best desserts of the season- today I figured I’d switch gears and talk about something of more sustenance. In the colder months, I hate to say it, while we love a good sandwich they’re often almost completely reserved for brown bagging lunches and Sunday afternoons after church. That doesn’t me we’re skimping on flavor though. A plain old ham and cheese is great, but we have a bevvy of other options to keep us looking forward to lunch time. When you’ve got things like our Spinach & Tomato Tuna Salad Sandwiches, Sun Dried Tomato Pesto Chicken Salad Sandwiches, or even these Chicken Cordon Bleu Paninis in your repertoire, a packed lunch is never too shabby. In the Summertime though, there’s a definite shift where we skip the heartier meat & potatoes style dinner more often, and all lobby for something filling but much much lighter. Naturally, I often turn to sandwiches for supper- not just any sandwiches though. They’ve gotta be uber yummy and filling because my guys are still gonna build up incredible appetites, even if the heat keeps them from eating quite as much in a single sitting. I’m pretty much heart ‘Caesar’ flavored anything, but especially the chicken + Caesar combo. 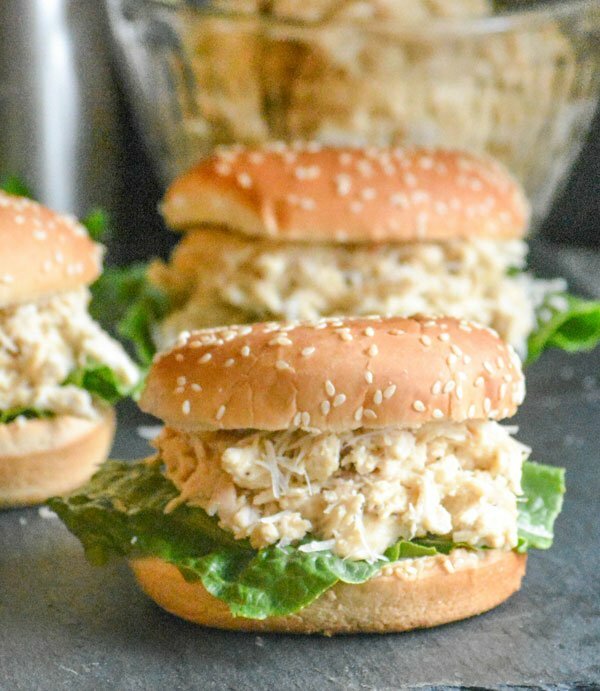 Making these simple Slow Cooker Hot Chicken Caesar Sandwiches and immediate must-try for me when I first stumbled across them on Pinterest several years ago. I mean what wasn’t to go googly-eyed over?! 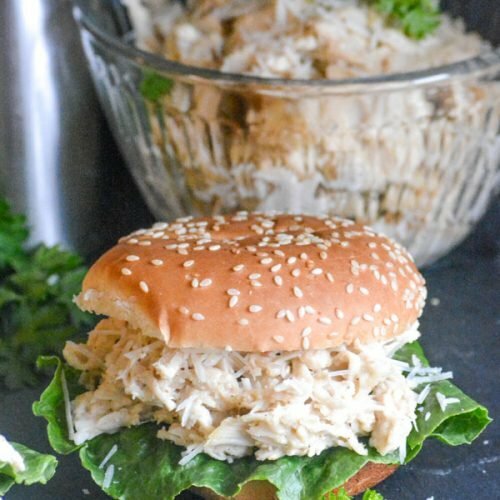 Slow cooked, tender shredded chicken marinated in a blend of your favorite creamy dressing and a pinch of red pepper flakes for that extra hint of spice. It’s stirred with a heaping helping of Parmesan cheese before being piled high on fluffy buns lined with several leaves of crisp Romaine lettuce. Topped with another sprinkle of cheese, and salted and peppered, add on the final bun for a sandwich that looks almost too good to eat. Don’t walk, run to your pantry and pull out your slow cooker or crock pot. Grab everything you need from the refrigerator & pantry shelves, and get a batch of this going for tonight’s supper. As an added bonus (if you actually end up with some), the leftovers from this chicken taste even better the next day when packed for lunches. 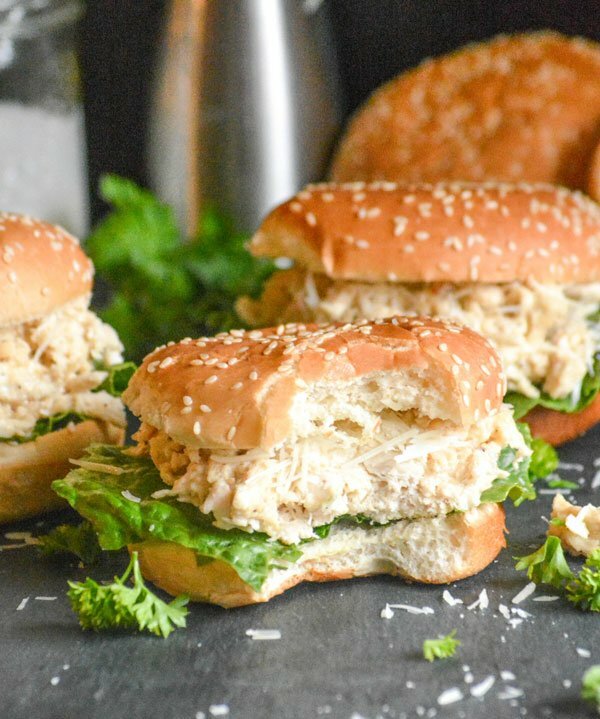 So even in the Summer, these Slow Cooker Hot Chicken Caesar Sandwiches come full circle for us- LOL. No complaints here though! From anybody, and how often does that happen? Other Caesar-style recipes you might also enjoy: Homemade Caesar Salad Dressing, Grilled Chicken Caesar Salad Sandwiches, Chicken Bacon Caesar Pasta, & Creamy Chicken Caesar & Wild Rice Casserole. 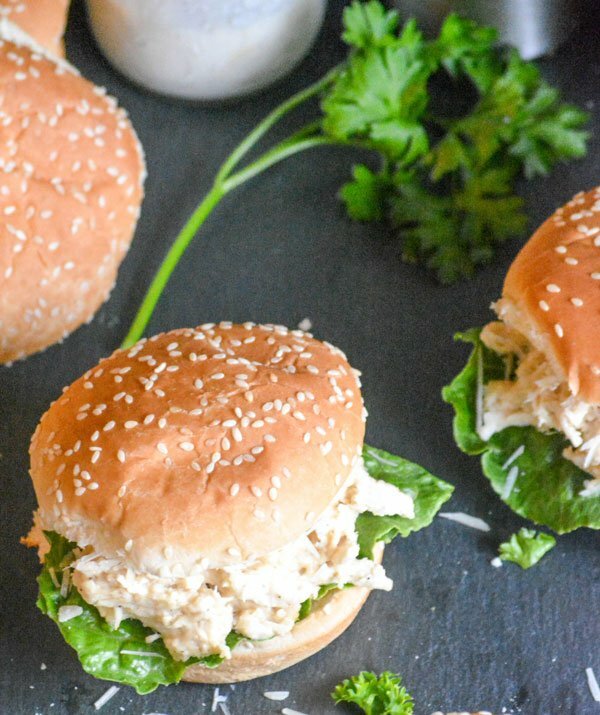 A filling sandwich, these feature slow cooked, tender Caesar dressing marinated shredded chicken on pillowy buns with romaine lettuce & shredded Parmesan cheese. Pour the chicken broth into the bowl of your slow cooker, and then add the chicken breasts. Cover, and cook on low for 4-6 hours, or until the chicken's cooked through. Remove the lid and transfer the cooked chicken to a cutting board. Shred using two forks or a pair of meat claws. Empty any liquid from the bowl of the slow cooker, place it back in the insert, and transfer the chicken back to the bowl. Add the dressing, 1/2 the cheese, parsley, pepper flakes, and salt & pepper to taste. You'll want to use twice as much freshly ground black pepper as salt. Stir everything to evenly combine. Cover, and cook another 30-45 minutes on high, stirring at least once. Top the bottoms of each bun with several leaves of lettuce. 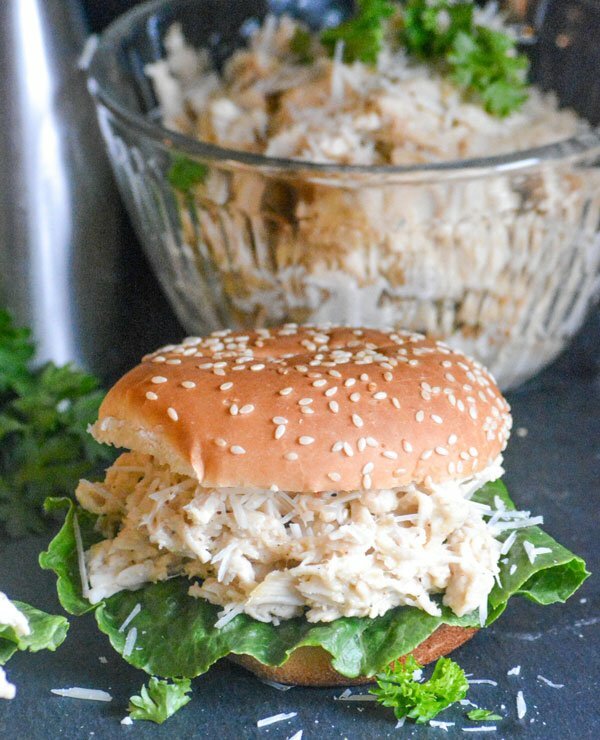 Add an equal amount of the hot Caesar chicken to each bun, spreading a bit to cover until all the buns are prepped. Sprinkle the remaining cheese evenly out over all the buns. Top all the sandwiches with top buns. Serve immediately. Like any sandwich, you can really serve these with whatever you want. We tend to serve them with a handful of potato chips and fresh fruit salad.